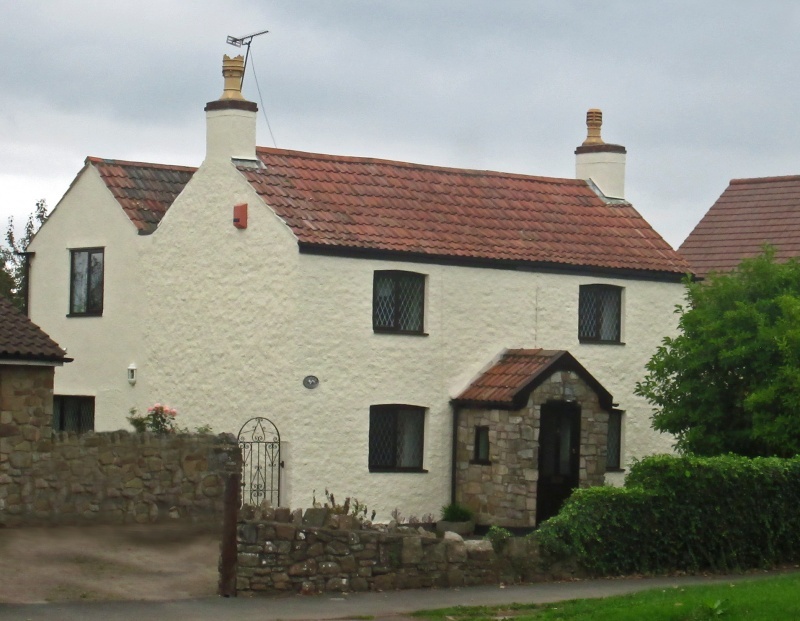 The house that was called Killiney for many years and then became Endrick Cottage stands in Gillingstool on the road from Thornbury to Grovesend. It was occupied for many years by the Liddiatt family. It was built on land that was described as plot number 520 in the Tithe Map of 1840. The Tithe Apportionment shows that the land was owned by William Hendy. There was a cottage elsewhere on this plot also owned by William Hendy but that was the cottage that later became South View, which today is next door to Endrick Cottage. It appears from the deeds of 29 Gillingstool that William Hendy had sold the property by 1853. Certainly there is a document of that date which says that the land on which South View and later Killiney were both built was owned by William Councell. William owned considerable property in Thornbury. He died in 1884. Click here to read more about William Henry Councell. We have very few records of any subsequent owners of this property but it eventually became the home of the Liddiatt family for about 80 years’. The 1929 rate book shows that it was then owned by ‘Miss M. C. Liddiatt’. This was Maureen Cecilia Liddiatt (see below). Killiney is the name of a seaside resort and suburb in the Dublin Bay area and it is noteworthy that Henry Liddiatt’s second wife Mary Bernice had connections with that part of Ireland. The 1881 Census shows that the house was occupied by William Liddiatt a sawyer aged 68 who was born in Thornbury. His wife Margaret was aged 60 and she was born in Henbury. They had two children living with them; Ann aged 21 an unemployed domestic servant and Frederick aged 18 who was a sawyer. By at least 1907 (and possibly from the death of his mother) William’s son Henry Liddiatt and his family were living in ‘Killiney’ in Gillingstool. The 1911 census appears to confirm this as it shows Henry Liddiatt aged 45 and his second wife Mary Bernice Liddiatt living in what we believe to be Killiney with their daughter Maureen Cecilia Liddiatt. Also living in the household was a lady who was described as a relative Bridget Margaret Cecilia Liddiatt a single lady aged 40. Cecilia (as she was always known) was a nurse who was born in Grahamstown South Africa and she was the sister of Mary Bernice Liddiatt. Henry and ‘Bird’ as she was known lived in Killiney for the rest of their lives. Henry died in 1929 and Bird in 1941. For many years Miriam Ada Appleby lived with the Liddiatt family. The earliest record of her living with them was in the electoral rolls for 1938. The register drawn up in 1939 in the advent of war shows that Miriam was performing unpaid domestic duties and that her date of birth was 29th November 1896. We do not know if Miriam was related to the family in any way. We have been told that she was their housekeeper. We have found a record on the FreeBMD website that shows that the birth of Miriam Ada was registered in Wells in Somerset in the first quarter of 1897. We understand that she was born on 29th November 1896. In 1909, according to a labour certificate, Miriam was residing at Evercreech and had attended school there. Miriam needed this certificate to exempt her from full time education, because she was below the minimum school leaving age when she started work. The Ancestry website shows that there are passenger lists which indicate that Miriam Appleby sailed into Southampton from South Africa in September 1926, May 1930 and December 1933. We have electoral register entries from 1938 until at least 1965 that show Miriam Ada Appleby lived in Killiney in Gillingstool and a probate record that shows that she died there on 13th July 1974. We have been unable to trace details of Miriam’s early life under the name of Miriam Ada Appleby. However there is a baptism record for Marian Ada Appleby daughter of Charles and Emma Appleby of ‘80 Above Town’. The baptism date is March 18th 1897 which fits with the registration date and date of birth of Miriam. Moreover, the census for Glastonbury taken in 1901 shows Marian A. Appleby was the daughter of Charles Appleby a gardener and his wife Emma. Marian was four years old at this point. There is another entry, this time in 1911, that shows Marian Ada Appleby was a 14 year old girl working as a between stairs maid in the household of Christopher Mullins Moody of Evercreech in Somerset. Evercreech is where Miriam was given a labour certificate. We have not found any FreeBMD records of the birth, marriage or death of a Marian Ada Appleby and believe that Miriam and Marian are the same person. We have been told that Miss Appleby came to Thornbury to work at Thornbury Castle. Miss Appleby seems to have been very caring and protective of the Liddiatt family. We were told that when William Thomas Liddiatt lived on his own in the cottage opposite she went over every day to check on him and that it was her that found him lying dead at the foot of his stairs. She was also said to have carried Maureen Cecilia Liddiatt’s bag every morning to the bus stop when Maureen was a teacher at Rudgeway. Bridget Margaret Cecilia was living with her sister and brother in law in the census of 1911. She was born on July 30th 1869 and baptised at the Garrison of Graham’s Town at the Cape of Good Hope. At that time William was a Private in the 32nd Regiment of the Light Infantry. Cecilia trained in St Steven’s Hospital (1890-91). 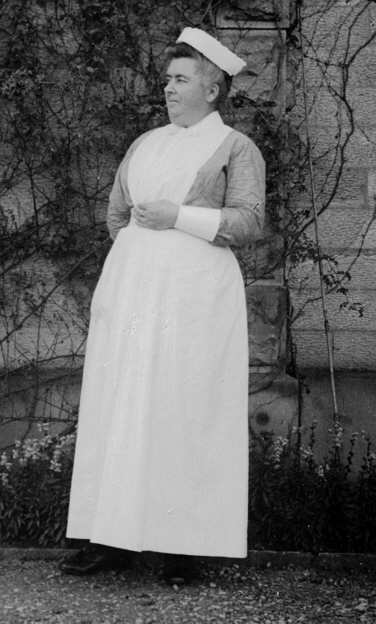 She worked in the General Hospital in Galway before working at the Lying-in Hospital in Dublin in 1894. Cecilia eventually worked as a private nurse in England. The 1901 census shows that she was a monthly nurse in Paddington, London, in the household of a stockbroker William Harris and his wife Marie, where Cecilia was presumably caring for Mrs Harris and their one month old baby. Cecilia became a highly respected member of the nursing profession, serving as their representative on the General Council of Nurses and Executive Committee and very active in the lobbies of House of Commons where she fought on their behalf. The British Nursing Journal appears to have had several references to her generosity. The 1911 census for Gillingstool shows that Bridgit Margaret Cecilia Liddiatt was also living with the family of Henry and Mary Bernice Liddiatt (see above). She was described as relative but in fact this was Mary Bernice’s sister who was generally known as Cecilia. The probate record shows ‘Bridget Margaret Cecilia, otherwise Cecilia’ Liddiatt died at Westbourne Crescent in Paddington, London, on 15th October 1934. Administration was granted to her sister, Mary Bernice Liddiatt. We have no knowledge of the later ownership and occupants of the house.